AFTER A LULL OF THREE MONTHS, THE WORLD SUPERBIKE CHAMPIONSHIP (WSBK) kicked off in Philip Island, Australia, and the MotoGP season kicked off in Qatar. History of sorts was created by Alvaro Bautista and the all-new Ducati Panigale V4 R. It was a race for the V4 Panigale. It was rookie bike and rider that claimed the triple crown of the super pole, race one, and race two. Bautista is a rookie in WSBK but has come from MotoGP and this just proves that the standard of MotoGP is much higher than that of WSBK. I wish one of the sport channels starts broadcasting the WSBK races live. For the first time, we saw the Japanese rider, Kaito Toba, win a Moto3 race. In fact, Kaito is a product of the Asia Talent Hunt Racing series which is open to all riders from Asia. We do not have a single rider from India in this series which is a stepping stone to Moto3 world championship. In Moto2, Lorenzo Baldasari won from Thomas Luthi who made a successful return to Moto2 after struggling last year in MotoGP. It was business as usual with the main protagonist, Andrea Dovizioso, and Marc Marquez finishing first and second and Cal Crutchlow making a brilliant comeback from injury to claim the last spot on the podium. 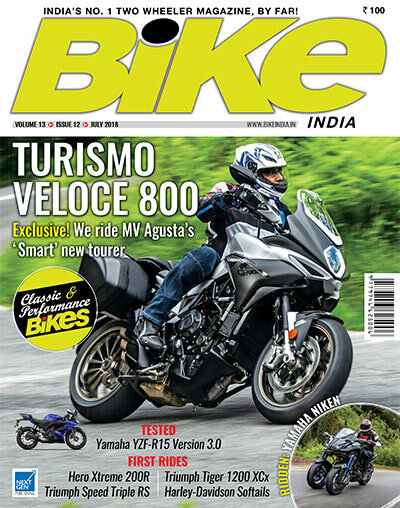 This month we have quite a few first rides, comprising the Kawasaki Ninja ZX-6R, the upgraded Bajaj Dominar, Benelli TRK502, Yamaha MT15, and the updated Yamaha R15 ABS. AT THE VERY OUTSET I WOULD LIKE TO CONGRATULATE ARAVIND KP FOR FINISHING THE Dakar Rally. The issue of Indian riders not being able to compete with their international counterparts and fighting for podium positions in any form of motorcycle racing, be it motocross or racing on the tarmac, still remains. 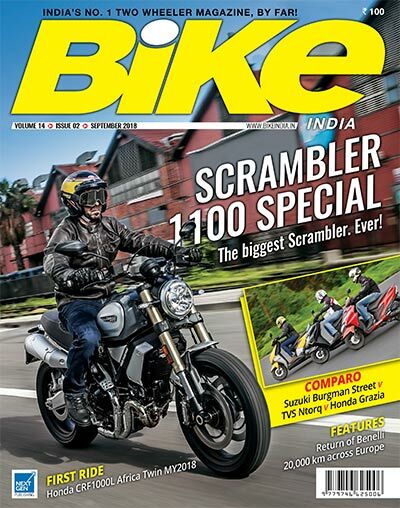 In this issue we have done an interview with Aravind KP in which he mentioned that this time he was riding between 65 and 75 per cent of his riding capability and that this helped him in not crashing during the raid. Because our boys lack the out and out speed of the international riders, they have to ride at 100 per cent, or even beyond that, just to keep up with a top-class rider. the IOM TT race was more satisfying than winning all the races I have won put together. 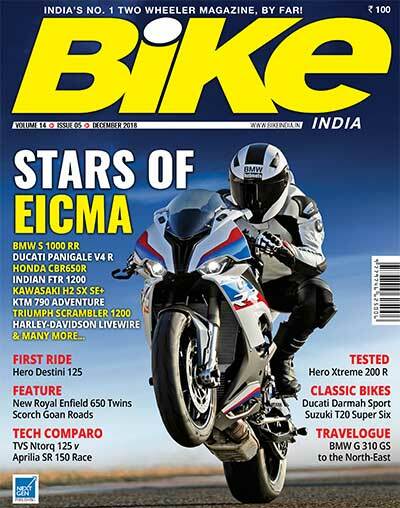 Last month we gave away the Bike India Awards. We had 34 two-wheelers vying for those. 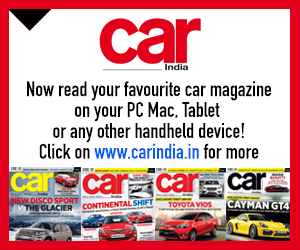 As many as 13 sub-200-cc motorcycles were launched during 2018 and there were 19 premium motorcycles contending for the Two-wheeler of the Year Award. After facing competition from the best in the world, the Royal Enfield 650 Interceptor was crowned the Two-wheeler of the Year. The Royal Enfield team, led by Siddhartha Lal, deserves all the accolades, for they have created a fantastic motorcycle. It is not that they made an excellent motorcycle and priced it out of the reach of the enthusiasts; their pricing is the real icing on the cake. The Indian economy is going through a to ugh time and especially the farming sector is facing a crisis. Naturally, this is taking a toll on the sale of two-wheelers, with most of the big manufacturers showing a de-growth or flat growth for the first time in many years. The Indian Motorcycle of the Year (IMOTY) award ceremony was held last month and the new Royal Enfield Interceptor had a landslide victory. The Royal Enfield team, headed by Siddhartha Lal, has done a fantastic job with the 650 twins and they deserve all the success. No doubt the twins are fantastic motorcycles, but the icing on the cake is the price; Royal Enfield are not ripping off their customers like others when they add a cylinder and double the price. Two -wheeler sales have been heading southwards for a couple of reasons, the first one being the cost of fuel and the second the cost of the mandatory five-year insurance for new bikes. 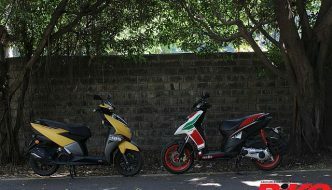 This has added another Rs 5,000 to Rs 6,000 to the cost of the entrylevel 100/110-cc motorcycles and scooters. Needless to say, this is a considerable increase when someone is scraping the bottom of the barrel to buy his or her basic mode of transport. Retro motorcycles are the flavour of the month. After the Royal Enfield 650 twins, Classic Legends have now launched the Jawa 300-cc motorcycle. The big difference between the two is that the Royal Enfield 650 is a modern retro design while Classic Legends have replicated the 1960s’ Jawa. It is a gamble they have taken and only time will tell whether they succeed with its styling. The second problem for Jawa is that Royal Enfield have set a new benchmark with the 650 twins in terms of performance, all-round rideability, and build quality. To better this, Jawa have their work cut out; they will have to produce a phenomenal motorcycle. 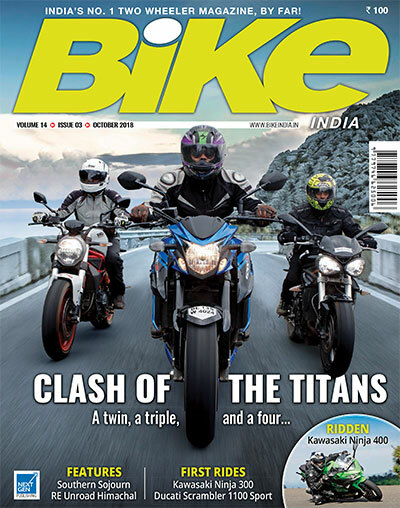 In this issue you may read the first-ride impression of the Jawa bikes. The police want to enforce the helmet rule for two-wheeler riders from 1 January 2019 and people and politicians have already started raising objections to it. I would like to wish all our readers a happy New Year and please wear a helmet while riding. Please don’t drink and ride. Obey all traffic rules, because you don’t only put your own life at risk, but also those of other road-users by not doing so. Think of the loved ones waiting for you at home. Wish you all a happy New Year once again and safe riding. LAST MONTH I RODE THE ROYAL ENFIELD 650 TWINS IN THE US AND WE WERE REALLY impressed by the two motorcycles. At that time I speculated that the Conti GT would be priced around the Rs 3 lakh mark and the Interceptor around Rs 2.75 lakh. However, Siddhartha Lal blew us all into the Arabian Sea in Goa at the launch with the announcement of the prices: Rs 2.50 lakh for the Interceptor and Rs 2.65 lakh for the Continental GT. In fact, Siddhartha reminded me about a discussion we had had at their technical centre in the UK last year about how manufacturers tend to double the price of a motorcycle when they add a cylinder to the engine, say, from a single to a twin-cylinder. The single-cylinder 535 Conti GT was priced at Rs 2,10,000 and now Royal Enfield have not doubled the price, but just charged the cost of adding another cylinder. With this pricing Royal Enfield are sure to shake up the motorcycle market and, in the process, have also shown how manufacturers have been taking the customer for a ride. Mahindra’s Classic Legends have brought the Czech brand, Jawa, back to life by launching the Jawa 300-cc, the “Jawa forty two”, and concept Perak with Bobber styling. Last month Hero MotoCorp showed four versions of the X Pulse at the biggest motorcycle show in the world, EICMA (the Milan Motorcycle Show). The four variants looked very impressive. After parting ways with Honda, Hero have gone from strength to strength. Taking on the best global players head-on is no mean feat. Hats off to Pawanji for achieving monthly sales of 7,50,000 motorcycles. A great job, sir! 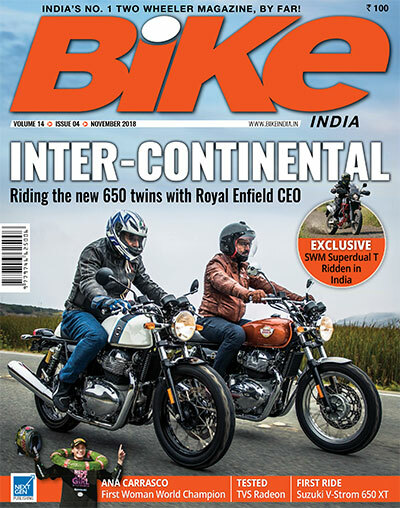 IT HAS BEEN NEARLY ONE YEAR SINCE ROYAL ENFIELD UNVEILED THE INTERCEPTOR 650 AND the Continental GT 650 at the Milan Motor Show and, finally, last month I got an opportunity to ride both the bikes in Santa Cruz, California. I was wondering why I had travelled half way round the world to ride motorcycles manufactured in Chennai, India. I got my answer after the ride; because these were among the best roads I had ridden on and probably the best in the world. The reason for the delay was that Royal Enfield did not want to take a chance with these bikes, being intent on ironing out all possible issues before the actual launch of the two twins. I was really impressed by these two motorcycles that Royal Enfield have come up with. The second surprise for me was the riding capability of Siddhartha Lal. A number of CEOs and MDs say that they can ride a motorcycle, but Siddhartha can genuinely ride well. We were riding hard and he kept up with us. 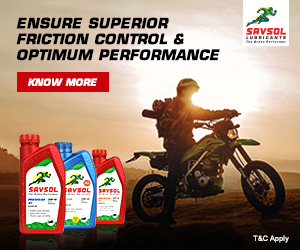 His passion for riding also shows in the products he has launched. This time Royal Enfield have really nailed it. decent, one has to pay toll for that “luxury”. Deadly pot holes too k their to ll on yet anot her family on the recent Rakshabandhan Day. Having celebrated the festival with their cousins, this family of four were returning home on their two-wheeler at night when they hit a pothole, lost control, and fell off the bike. The children were run over by a truck and died on the spot while the parents suffered serious injury. No doubt bad road conditions in the country are to blame for many of the accidents, but, at the same time, why were four people travelling on a two-wheeler which is meant for two persons only? It is high time the police enforced the law and prohibited more than two persons on a twowheeler, including small children. Having seen a family of four riding on a two-wheeler, Ratan Tata decided to give Indians an affordable car: the Nano. However, lack of enforcement of traffic rules made sure that the Nano did not become a success. Had the traffic rules been enforced effectively, not permitting more than two persons on a two-wheeler, the Nano would have been a great success and a number of lives could have been saved. Similarly, there should be a stipulation as to the size of the seat of a scooter or motorcycle. At the first ride of a commuter motorcycle, the representative of the concerned company said that they had extended the size of the seat to accommodate more than two persons. That is a wrong signal being sent to the people, indirectly encouraging them to carry more than one pillion rider. do not want competition from international brands and, in the process, are depriving the citizens of the country of the right to protect themselves. Incidentally, we have a Rs 350 Rocker helmet bearing the ISI mark. It feels as if it is made of cardboard. I would like to know the ISI safety standard in respect of that helmet! Moto rcycle riders, especially those who care about their safety, are up in arms against the new helmet rule promulgated by the Union Ministry of Road Transport and Highways which makes the storage and sale of non-ISI helmets illegal. Yes, we do need to put a stop to roadside sale of helmets but not the high-end ones such as Arai, AGV, and other reputed brands. As a matter of fact, I have seen roadside helmets being sold with ISI marks on them. How then does one tell the genuine ISI mark from a fake one? Speaking personally, I will never wear an Indian-made helmet on a racetrack. I recall a Bell helmet advertisement in the 1970s when they had launched a helmet priced at £350 (Rs 31,500). Compared to that, the rest of the helmets then available in the market were priced between £100 and £150 (Rs 9,000-12,500). “Isn’t your head worth the extra money?” the advert asked. The Indian helmet manufacturers’ lobby may want this rule but let us be honest to ourselves: are the local manufacturers capable of making helmets that will meet international standards? The answer is a big NO. You cannot stop the sale of good-quality helmets that surpass the ISI standards. Next month I am going to ride the most awaited 650 twins from Royal Enfield in California, USA . If Royal Enfield get the bike right, it will mean a major success for them. The 650-cc twin is just about the right combination motorcycle for Indian conditions; it won’t be very heavy and bulky and, at the same time, it will have enough performance with good manoeuvrability. My very first motorcycle was the Triumph Bonneville 650-cc twin, producing 47 PS , and it was just perfect for India. I do hope Royal Enfield get this one right. 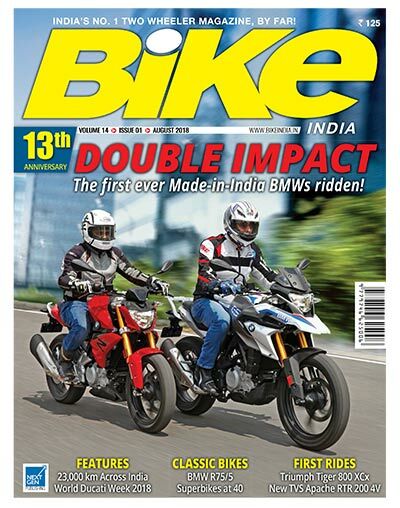 THIS MONTH BIKE INDIA COMPLETES 13 YEARS OF PUBLICATION. 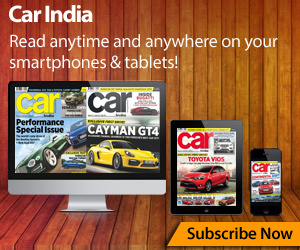 AT THE TIME OF THE magazine’s inception in 2005, the senior management had the easy option of adopting the proven formula of starting another automotive magazine, just like all the other magazines being published in the country at that time. 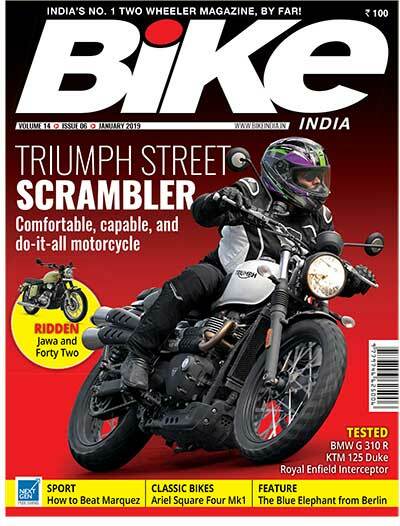 However, it was a bold step on the part of Next Gen Publishing to launch a dedicated two-wheeler magazine. 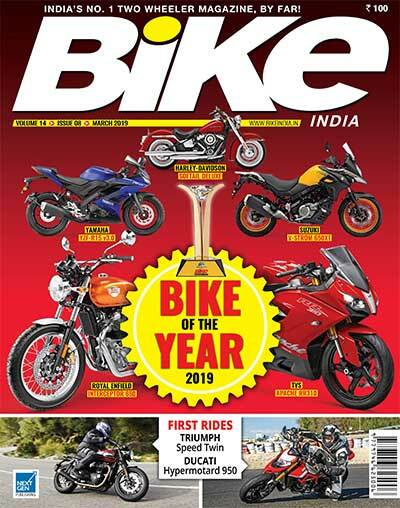 Today we stand vindicated, for Bike India has grown from strength to strength thanks to the unstinting support by you: all our readers and manufacturers. The most awaited motorcycles to be launched in India — the BMW G 310 R and G 310 GS — were launched on 18 July and the wait was well worth it. 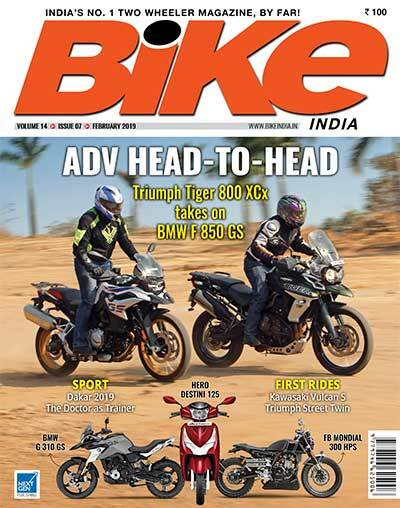 We had the opportunity to ride both the bikes; you may read the first ride report in this anniversary issue. This is the first time I have witnessed an Indian-built motorcycle that is not built to a cost. From the switchgear to the quality of plastics and all the other components, everything is top-class and can be compared with the bikes’ bigger, more premium siblings. For example, the axles are drilled to reduce unsprung weight and there is not a single component on the motorcycle that you can associate with cost-cutting. The only thing that lets the premium feeling down is the backlash sound from the engine at idling. 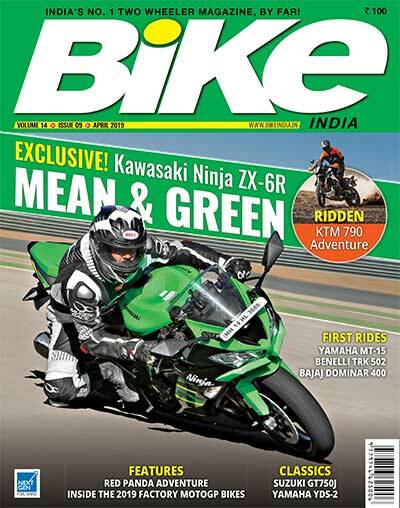 Once again, I would like to thank the marketing team at Bike India and the entire editorial team, photographers and, last but not least, the designers for their hard work throughout the year to bring out the magazine. 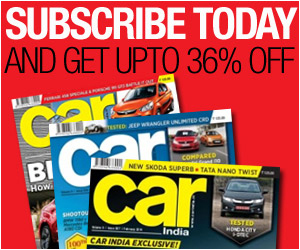 A big thank you to all our readers and manufacturers for their support. Please wear a helmet while riding, obey all the traffic rules, take care, and enjoy your ride! New Safety Measures: Are They Any Good? The new braking system made mandatory as part of the safety regulations for two-wheelers does not make sense on account of the fact that the mechanical linked braking system has a flaw. The hydraulic linked braking system is fine because it is self-adjusting and the braking pressure to the front wheel and the rear wheel is regulated via a valve. In the mechanical system, on the other hand, it is done with cables and the free play on either side determines the amount of braking pressure to both the wheels — if the cables are not adjusted properly or if one of the brake liners wears out more than the other, then only the front or the rear brake will operate. This makes the system even more dangerous than a standard set-up wherein you know exactly how much braking pressure you are using on the front and rear brakes. The mandatory ABS (anti-lock braking system) for motorcycles above 150 cc is another sham, because the manufacturers are providing ABS for the front brake only — the rule does not specify that both the wheels must be equipped with ABS . ABS is used mainly in emergency situations and at that time the rider normally applies both the brakes. Under hard braking the weight of the bike is transferred to the front wheel and there is hardly any traction on the rear wheel which tends to lock up — and if either of the wheels locks up, the rider tends to lose control. ABS should be mandatory for both the wheels if the aim is to enhance the rider’s safety.